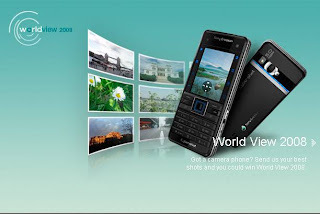 World View 2008 Mobile Photography Contest ~ Philippine Freebies, Promos, Contests and MORE! Win the trip of your dreams when you join in World View 2008 Mobile Photography Contest sponsored by Sony Ericsson and Phil Star. Just upload your mobile photos online and Win a Sony Ericsson K770i Cyber-shot phones or a Trip for two worth approximately £10,000/€12,500! That's already close to a P1,000,000! Doesn't hurt to try! Send those pictures now! "Valid travel documentation such as passport (minimum validity six months from outbound travel date) and/or visa as applicable and comply with any customs, immigration or other regulatory requirements for full and unlimited attendance"
"The Promoter (or any third party on behalf of Promoter) may use the Winner’s name and image as well as any other contributions in the Competition for future promotional, marketing and publicity purposes in any and all global media without further consent or payment"
If you are willing to buy fashionable mobile phone accessories of cell phone covers, cell phone cases and many more and that too for free shipping then choose from http://accessoryexportwholesale.com/ for reputed brands. I have joined the SE World View 2008.
it's fun and cool to see pictures from around the world..
but if you take a look at the picture, there's a date of baby's birth that is in year 2007. Don't we should post a photos that taken in 2008?? ?